1. 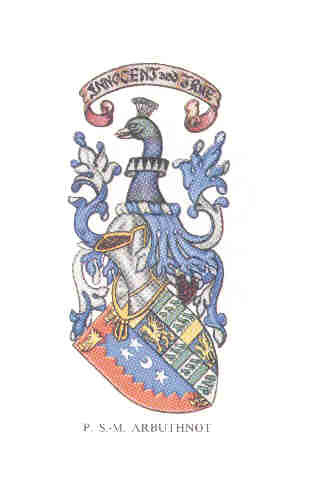 What are the arms of the Arbuthnot(t)s and how did they come about? 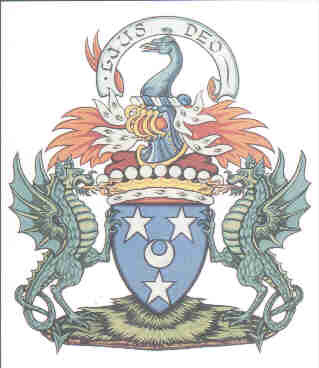 All the Arbuthnot(t) arms are Scottish and therefore the motto is above the crest. the Arbuthnot of Kittybrewster baronet (created 1964, currently held by Sir William Arbuthnot). 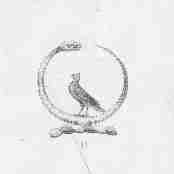 The Viscount of Arbuthnott's crest is "a peacock's head, couped (i.e. cut) at the neck, proper (in natural colours) beaked Or (gold)". 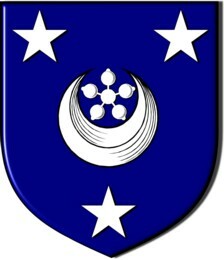 His shield is "azure (blue), a crescent between three mullets (stars), argent (silver)". His motto is "Laus Deo" (Praise be to God). 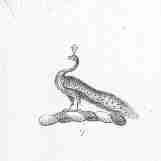 The Hon Hugh S. Arbuthnott's crest is "a peacock's head couped proper; gorged with a collar Argent charged with a cross engrailed Sable". 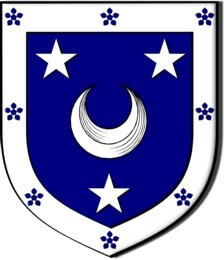 His shield is "Azure, a crescent between three mullets Argent; a bordure of the last, thereon eight torteaux, each charged with a cinquefoil Ermine". His motto is "Laudo Deum" (I praise the Lord). 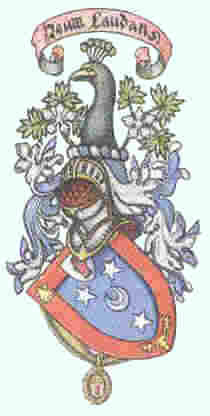 Sir Keith's crest is "a peacock's head, proper"
His shield is "Azure, a crescent between three mullets, two and one Argent, the whole within a bordure, Or, charged with three boars' heads, couped, Gules". His motto is "Innocent and true". It is unusual for a commoner (meaning one who is not a Peer) to be granted supporters and it is said that Sir William Arbuthnot, 1st Baronet of Edinburgh, was granted supporters when, as Provost of Edinburgh, he hosted a dinner for the King who enjoyed himself so much he offered supporters to William if he was able to walk round the table without support. Sir William's crest is "a peacock's head and neck proper accompanied on either side by a spray of strawberry leaves vert each flowered of a cinquefoil argent". 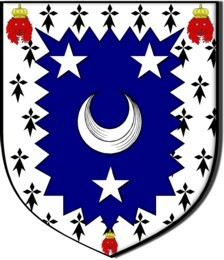 His shield is "Azure a crescent between three mullets Argent, a bordure Gules charged with two escallops in chief and a buck's head cabossed Or in base, and in centre chief (overlapping the bordure) an inescutcheon Argent charged of a sinister hand erect epaumee couped Gules". His motto is "Deum Laudans" (Praising God). The sources of these are not always complete and, as stated, each coat contains crest and shield. II and III, argent two bars between nine maartlets vert (for Aylard). indented gules charged with three boars' heads couped or. 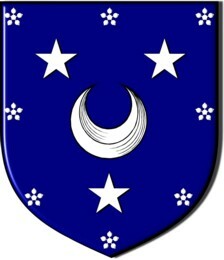 1429: Azure a crescent between three mullets Argent within a bordure crenelle Or. 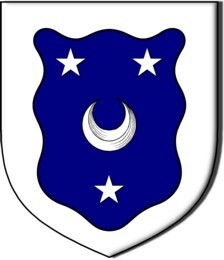 Shield: Azure, a crescent between three etoiles, two and one argent, the whole within a bordure. Motto: Interna proestant (Internal things stand fast / Inward things are best). 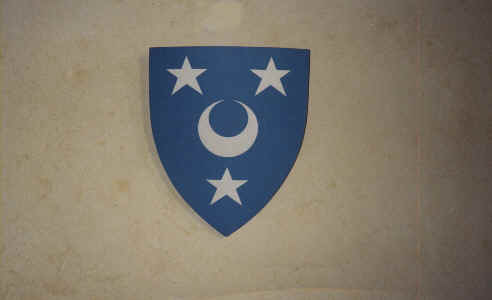 Shield: Azure, a crescent between three etoiles, two and one argent, the whole within a bordure argent. 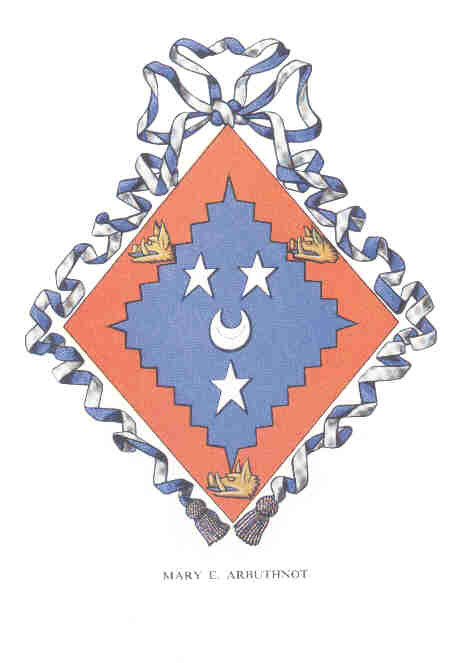 the crescent between three mullets argent. 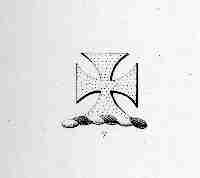 A similar description: Gules, a chevron between two mullets in chief and in base a crescent ensigned by three passion nails in pile all Or (Wishart of Pitarrow is Gules, three piles in point Or). 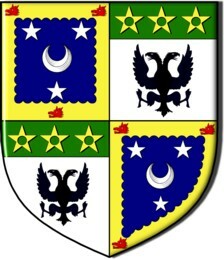 Shield: d'argent, � trois arbres arrach�s de sinople 2 et 1. 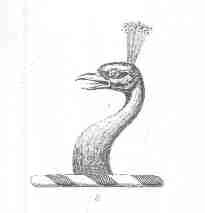 Crest: A peacock's head couped at the neck Proper collared Ermine between two keys in saltire Or one on either side of the head. 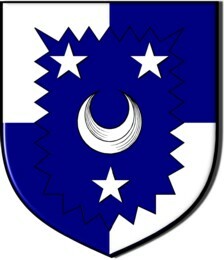 Shield: Dexter: Azure, a crescent between three mullets Argent; Sinister: colour a chevron colour2 between three fleur de lis colour3 on a chief colour4 three roundels colour5. Arbuthnot-Leslie of Warthill (matriculated 7 May 1947). 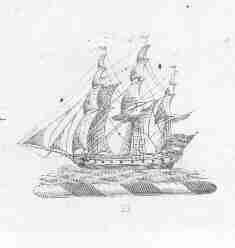 fess Azure charge with three buckles Or (Leslie of Warthill ancient and Cruikshank). The arms are in a church in Stonegrave, Yorkshire. Arbuthnot and Dorothy Hassell (dau of James Hassell). 2nd and 3rd, vert, three adders palewise argent (for Hassell). The images marked *O were created by Orror and the images marked *B were created by Bruno_vallette. They are licensed under the Creative Commons Attribution ShareAlike license 2.5, 2.0, 1.0 (see Creative commons licences. 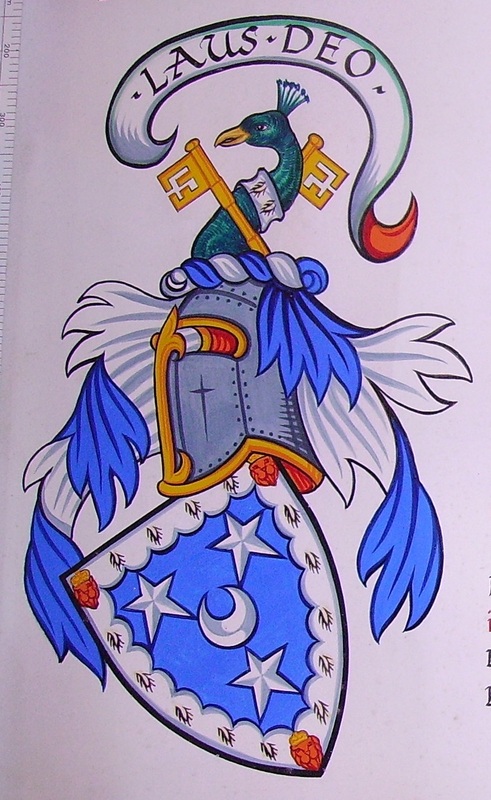 The crests marked *F were scanned from ''Fairbairns Book of Crests''. All contents of this site Copyright � Sir William Arbuthnot Bt 1997 - 2003. All rights reserved.